God refers to Politicians as the “Basest of Men” (ref Dan 4:17); Paul and Titus knew them as “Cretans”. Weaponized Tick research was done at Plum Island under Nazi scientist (brought to America during Operation Paperclip by Richard Nixon) and Rockefeller Institute research fellow (Whore) Dr Erich Traub. Prescott Bush and George Romney played their respective parts in providing finance and aluminum to the Nazi empire. Traub pioneered weaponized Ticks for use by Stalin’s Russia and Hitler in the destruction of livestock; Lymes Disease was one such creation of Tick to human disease. Bird Flu resulted in the culling of millions of Chickens (Bush EPA and HHS Sec. Mormon Mike Leavitt played a large role); Swine Flu resulted in the culling of mlliions of Pigs and Foot and Mouth the culling of millions of Cattle; all likely Pulm Island creations. Mitt Romney adviser 33° Mason/International War Criminal Henry Kissinger “Control Oil, you control Nations. Control Food, you control People”. No wonder the Mormon Church owns the largest Cattle Ranches and Farms in the US. Join the Church and you get a “Ticket” to the Bishop’s Storehouses; stay “Separate” ie “Holy” and Jesus will give you a Ticket to Eternal Life. Perhaps not coincidentally, New Orleans area Home Depot stores are stocking thousands of portable generators. A record 1.8 million Muslims arrived in Mecca for the Hajj 2012 Oct 14-15, many by air. Want to be in a pressureized tube of recycled air with 250 people infected with CCHF? 97% of Dromedary Camels have Tick infestations, the H dromedarii tick is the most common tick and carries CCHF. CCHF (Crimean-Congo Viral Hemorrhagic Fever) is a Tick born “Zoonoses” (Animal to Human) disease. Prof John Oxford, a Virulogist at Queen Mary (Bloody Mary; Cute name eh?) Hospital at the University of London predicted an “Armageddon (Mount of Slaughter) Virus” such as CCHF would emerge during the next 5 years. He may be correct. Andromeda means “Ruler of Men”; the Andromeda Strain a “Doomsday Virus”; note the common root with Dromedary and Mahomedan. CCHF cases have been reported since May 2012 in Turkey, Saudi Arabia, Sudan, Oman, Pakistan, Kuwait, Dubai, Qatar, Iraq, Afghanistan, Iran and now in October 2012, Great Britain, having spread from Afghanistan by Fazal Ahmed, whose funeral was held on Oct 8. Ironically, this was the 8th “Great Day” of Feast of Tabernacles (22 Tishrei); the day Jesus was Circumcized in accordance with the Jewish Law He wrote. Again, note the inscription under the Papal Chair of St Peter has the phrase “There is no God but Allah and Mahomet is his prophet”; the Black Stone of the Ka’aba (Sacred Enclusure) is the Stone of Jupiter (Acts 19) worshipped by followers of Diana (Witchcraft=Craft). Ka’aba and Kaballah have the same root “Enclosure” because they have the same Gnostic/Chaldean source. The Constellation Cassiopeia is also a representation of the “Sacred Enclosure” idolized in the 1600’s by women such as Solomon’s mother Bathsheba, Deborah (Barak’s military commander; Sounds familiar today in Hillary; Hilarious eh? ; Dabar is Chaldean for Word as is Bee; Mitt Romney is one such Priest of the Queen Bee, Diana “Essen”), Mary Magdalene (Madgala means Tower to Heaven; she became the origina of the Holy Grail/Merovingian nonsense) and Muhammad’s daughter Fatima, the origination of Shia Islam. Pope John Paul II even made famous the “Visions of Fatimah”; in the movie Omen III: The Final Conflict Cassiopeia has the sign of the 2nd Coming. Out of Cassiopeia came Andromeda and the Andromeda Strain aka Armageddon Virus and the Omega Man, given his ticket to life by Vaccine. Making any sense yet? Hollywood means Holy Wood; Get it now? Mitt Romney has been told for 40 years he is “The One, Mighty and Strong clothed in Light” to usher in the 2nd Coming? Mahmoud Ahmidenijad, a “Twelver” has been told his “Divine Mission is to usher in the Messiah “al-Mahdi”. Benjamin Netanyahu is also actively hastening the arrival of a “Jewish” Messiah. Sorry, Benny, you are not Jewish any more than Mitt Romney is Christian or Mahmoud Ahmadinejad is Muslim; all of you are Luciferian “Ticks” ruled by Andromeda “Ruler of Men”; Jesus is the Jewish Messiah! Remember Him Benny? He was Hung on the Tree to take on those Sins! In addition, “Tick” means “Sound of a Clock; Reprimand; Dismiss; Make Iineligible and Credit”, the latter a shortened version of “Ticket”. The most powerful weapon International Bankers have is access to credit; does this sould similar to access to a “Ticket”? In mythology, Andromeda, rescued by Perseus became the basis for “Sacred Marriage” Rites; we saw that on display in the movie Clash of the Titans. Want that Ticket? Join Freemasonry; Want a ticket to Heaven? Stay Out! The incubation period is 5-7 days for CCHF; the fatality rate is staggeringly high. Why is the US has over 200 Civilian Inmate Detention (Quarantine) facilities in place with staff already recruited and the House of Representatives just approved HR 6566 “Mass Fatality and Religious Consideration Act”? A Government of the People? Not on your eternal life. Hypothetically, what happens after the Hajj as Muslims return? Britain, France, Germany have sizeable Muslim populations as does Detroit; Area Code 313 where Mitt Romney was born and the number of ! in the Authorized Bible. The first ! is Abraham’s plea for Ishmael; the last when “Babylon” falls. Coincidence? 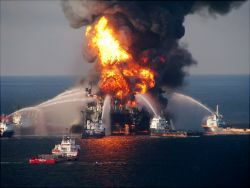 The Gulf of Mexico is the place where the world’s ocean currents converge; Deep Water Horizon was no accident and is continuing to destroy the world’s oceans. The Atlantic Gulfstream has moved far north and the Arctic and Greenland is melting rapidly (This is offset by Antarctic Ice Pack increases; more on this later), meaning another year in the meat locker for Britain, Scandinavia, Europe and Russia. Fukushima is the location where the Pacific Ocean currents converge and the Pacific Jet Stream begins; liekwise, the Reactor Meltdowns were no accident (Nazi company Siemmens manufactured the coolant controllers); recall BP is “Anglo-Iranian Oil”. Weaponized “Ticks”; a potential human wellspring of “Zoonoses” (Animal to Tick to Human then Human to Human transmission via body fluids, coughs, sneeezing) in Mecca with CCHF at the Zamzam Well where Hagar and Ismael (God said Ishmael would be against everyone and everyone would be agaisnt him) were nourished and a potential “October Surprise”; The stage is set to be sure. If you don’t have Jesus Christ in your personal life (I’m not talking about Churches, Priests, Pastors, Christmas or Easter here), now would be a great time to do so in your Prayer Closet. Jesus said, Except those days should be shortened, no flesh would remain” Are we at Rev 18 “Fall of Babylon”? No. We are however nearing the arrival of “al-Mahdi”, the fake “Jewish” Messiah and the Mormon “Christ”. No way in Hell folks! The Pale Horse is “Death” and “Hell” follows this horse; this is “al-Mahdi” aka 3rd Beast. The Omega Man (played by 33° Mason, Bohemian Grove Initiate Charleton Heston) had the Ticket to life after. The movie was based on “The Last Man on Earth” and “I Am Legend”. The Andromeda Strain also wiped out most life on earth from an Alien virus. Folks, Jesus is the real Omega Man; just say no to these “Brotherhood of Death” Initiates like Dr Erich Traub and his clients Adolf Hitler, Mao Tse Tung and Joseph Staliin. Get Jesus and get Him now!